As part of our visit to Umbria, courtesy of GAL Ternano, Tom Weber, The Palladian Traveler, and I were invited to visit Cantina Zanchi just outside the beautiful town of Amelia. 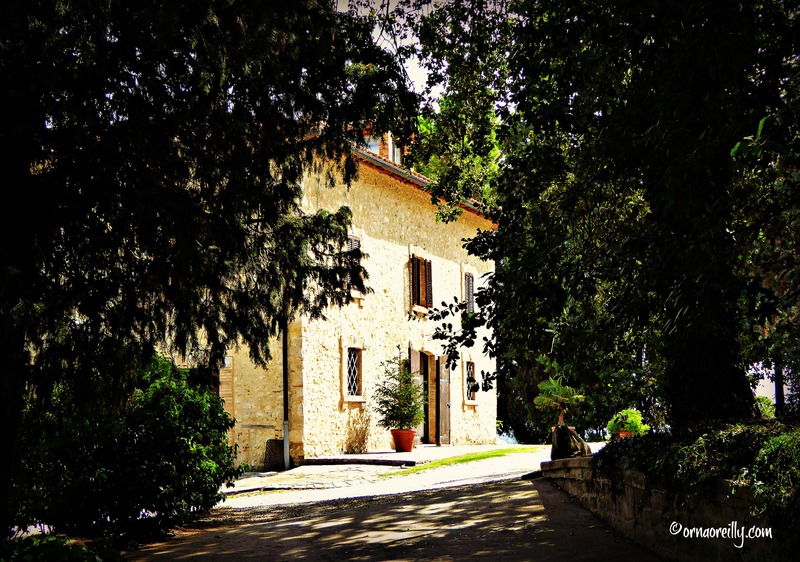 On arrival, we passed in front of a gorgeous farmhouse and were reminded that the business was founded forty years ago by Licurgo Zanchi who bought this house here in the hills of Umbria and began growing vines. 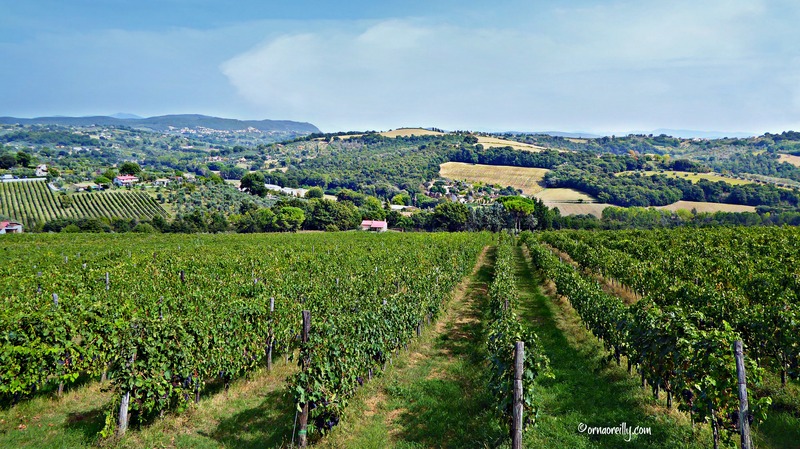 As the land had not been farmed until then, it was with great patience and perseverance planting native Umbrian grapes that the first vines were brought to fruition. Licurgo’s son Leonardo and his wife Anna Maria have developed the vineyard to its present state and now Licurgo’s grandchildren are playing a leading role in the production of their excellent wines. 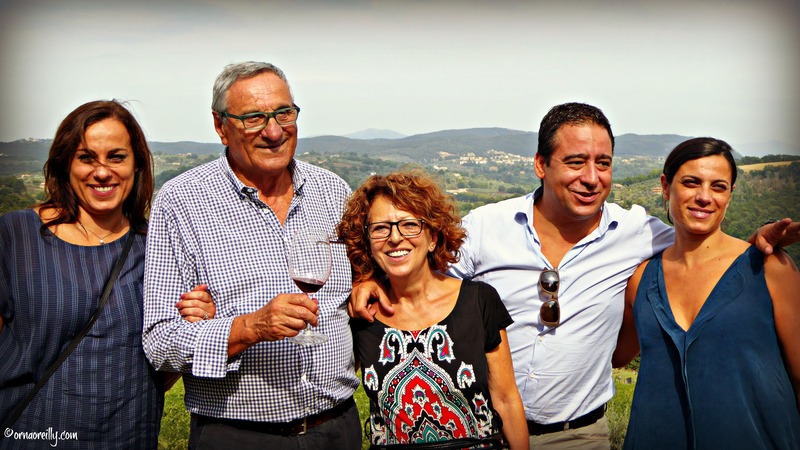 Cantina Zanchi has therefore been a family affair since 1970 with Leonardo’s daughters Flores and Flaviana, plus Flaviana’s husband Mario, involved in the business and working alongside their parents. 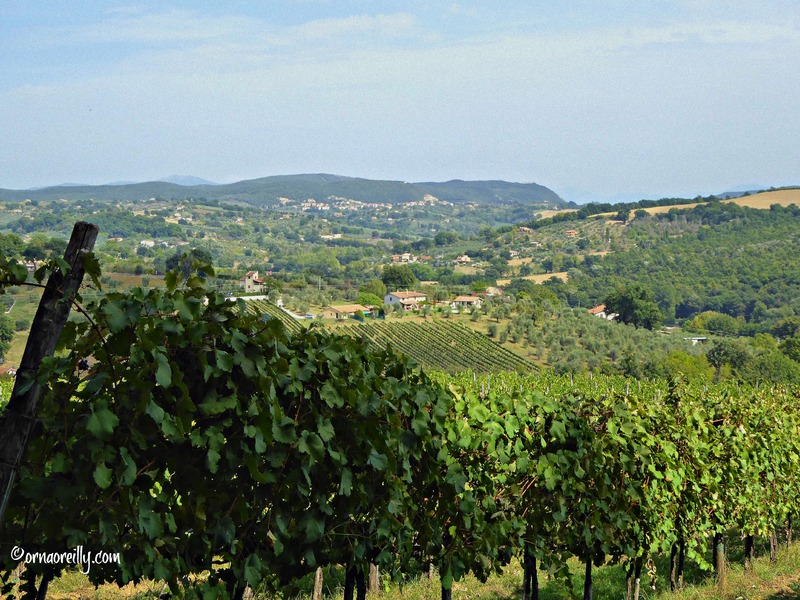 Azienda Zanchi has 30 hectares under vines. 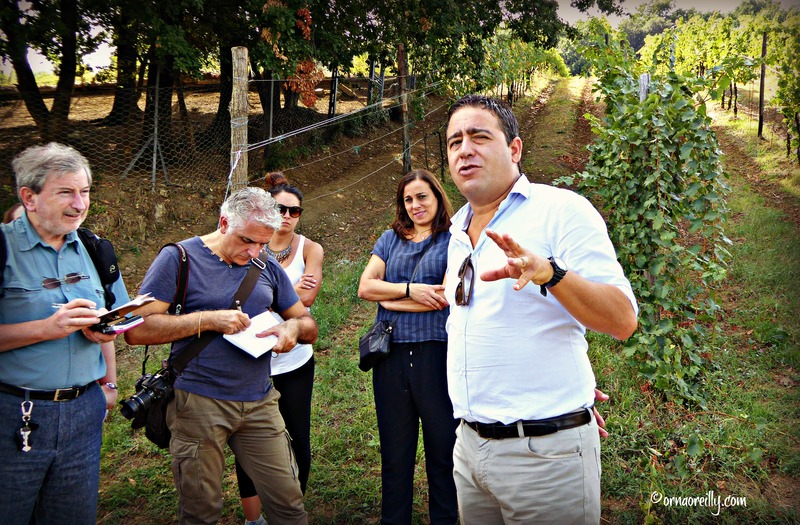 Mario then stood amongst these very vines and told us about the different varieties growing there, which include Ciliegiolo, Grechetto, Aleatico, Malvasia, Trebbiano and Sangiovese. We were invited to taste some grapes still hanging abundantly on their vines. I tasted the deliciously sugary Datterino table grapes, with tiny seeds, which still make my mouth water when I think of them. I also tasted some Malvasia and Trebbiano which were white and sweetly tart. Taking a walk around the vineyard was lovely. Set among rolling hills the grapes grow in idyllic surroundings and I was soon strolling languidly amongst the rows of immaculately tended vines. There is also an experimental vineyard, worked in collaboration with the University of Perugia and begun in 2009, where ancient indigenous grape varieties are being cultivated. Excitingly, this will be their first year of yield, so watch this space! Wines available from Cantina Zanchi include (among others): Areia, which is a Chardonnay; Sciurio is made of a blend of Sangiovese, Canaiolo and Merlot, which is aged in oak barrels; Arvore is made from Grechetto; Armanè is a blend of Sangiovese and Ciliegiolo, briefly aged in oak barrels and last, but not least, Carmino, made from Ciliegiolo grapes. As is the case with most wine producers, Zanchi also produce grappa. Theirs is made from the Ciliegiolo grape. After our exploration of the vineyard and cantina, we were invited to have lunch on the terrace to sample some local products. We needed no second invitation; we were prepped and ready to eat after our early morning departure from Terni and all the strenuous activities we had undertaken, such as visiting Arrone and the Marmore Falls. And what a lunch! The tables positively groaned under the weight of delicious food and wine that was spread before us. Tasting the wines that were paired so effortlessly with the local foods was an excellent and appropriate experience. BRAVA! A five-star post with matching cinque stelle photos. The food frames are making me terribly hungry right now. Thanks for the praise Tom. We had a lovely time at Cantina Zanchi. What a great lunch! Wish I were there. Your pictures are always so beautiful. Thanks you for sharing. You’d have loved it. Sitting outside in the sun outside a gorgeous old farmhouse overlooking hills covered in vines, while eating the local produce and sipping the wines…………..what can I say?! Fab. 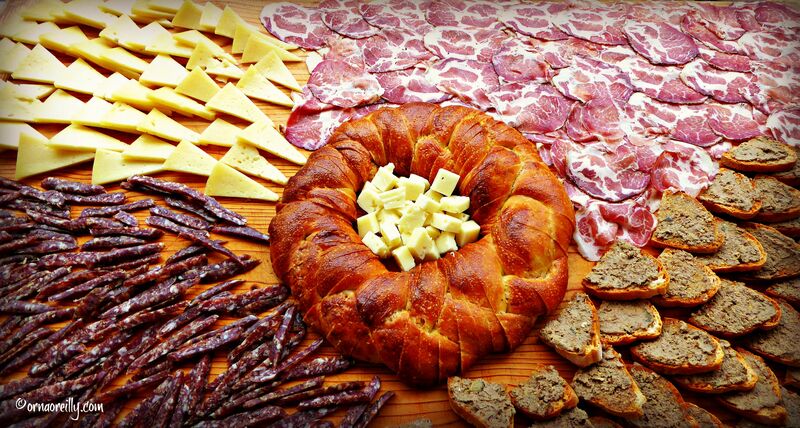 Tasty, tasty, very very tasty!! 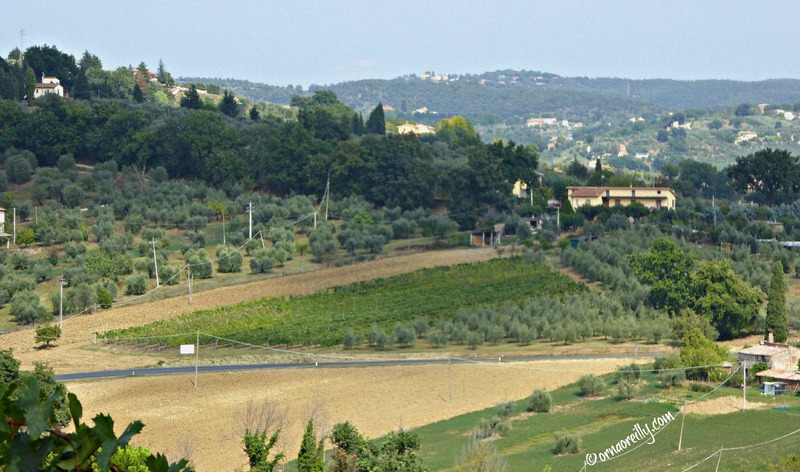 Great post and pics as always Orna, Umbria is fast becoming one of my fav regions!! I love these days in Italian vineyards. My sister has a fabulous vineyard and winery in Victoria, southern Australia. She started it from scratch 25 years ago and now they produce some of Australia’s best Chardonnay and Pinot Noir. It is hard work, but worthwhile when the results are so good. You poor dears, having to put up with all this homemade goodness. 🙂 Thanks for sharing. Victoria, it was just lovely. Everything was quite perfect. Amelia is a must-visit destination in Umbria. I will post the trip.